A pre-employment drug screening in Arizona can determine your viability for a job. 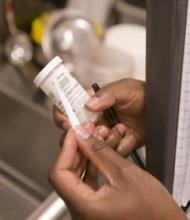 Drug test locations should be convenient, reliable and provide results fast. FastMed Urgent Care is exactly that kind of drug test location. FastMed drug screening locations are located all across Arizona – use your zipcode to find the pre-employment drug screening location nearest to you - and all have on site laboratories. That’s particularly important if you’re looking for drug test locations. Drug test results are fast – no down time shipping samples to an outside vendor, and no additional cost. FastMed Urgent Care accepts most major insurance plans and works with employers in Arizona to provide a pre-employment drug test and employee drug test. Drug tests are normally sought to during an accident investigation or when there is reasonable suspicion of drug use. AZ employers must keep an employment drug testing policy and provide it to all employees. In the event of a drug test is positive, the drug test result must be confirmed by a second test using a different chemical process than the initial screen. FastMed is all about ease of doing business – we have in-house labs for drug testing, digitized health records and online payment options. The drug screening locations at FastMed Urgent Care are walk-in medical clinics, open 365 days a year. Please check our occupational health services if you’d like more information about setting up an account with FastMed.